These are just a small sampling of what can be done through installing a home automation system. Future Home Technologies can help create greater functionality or the right mood in each room in your house. We can install a lighting control system throughout your house or an affordable system for just a room or two. Imagine all the lights in your family room dimming perfectly when it’s time to watch TV or the lights automatically coming on when you come home. Home automation systems like Crestron or Vantage sometimes require you to completely re-wire your home. Every keypad, light switch and thermostat has to be directly wired to the “brains” of the system. In many cases, it would cost you $80,000-$100,000 to put in a complete system. All of the equipment is proprietary so you are stuck buying all the automation equipment from one company, no matter the cost. Maintenance of these systems is also very high. As a solution, companies have come up with two new wireless standards called Zigbee and Z-Wave. These are open standards that any company can build products that can talk to other products. For example, if a home automation manufacturer builds a Zigbee-compliant light switch, any other company can build another product that talks to or controls that product. Over the last 4-5 years, a number of companies have developed these products along with control systems. Control4 manages all the home A/V equipment like any other universal remote. It also allows you to control lights, thermostats, music and even surveillance cameras. We are an authorized Control4 dealer. 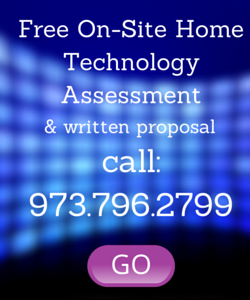 Contact us today for your free in-home estimate on all our home automation services. Why go to anyone else? We serve Bernardsville, Summit, Morristown and Northern New Jersey. Control4 automation images are courtesy of Control4 Corporation. Your crew was very professional and very tidy! Thanks again for accommodating our schedule. Appreciate your help & attentiveness in getting us up and running again! Thanks for everything! The music throughout the house is wonderful! Future Home Team: I have to tell you that the Sonos system that you set up for me 10+ years ago was such a blessing and you guys did such a great job and made things work easily! If you recall what you did in my basement with the TV/xbox//receiver/cable/PC, etc. is awesome still to this day and works great through the surround sound. Thanks again! The Future Home team did a great job, as usual. Thank you for your prompt response. I am so pleased that I became aware of your company. Kind regards.